Israeli soldiers abducted, overnight and at dawn Thursday, sixteen Palestinians, including a child, only 12 years of age, during invasions and searches of homes, in different parts of the occupied West Bank, including East Jerusalem, the Palestinian Prisoners’ Society (PPS) has reported. 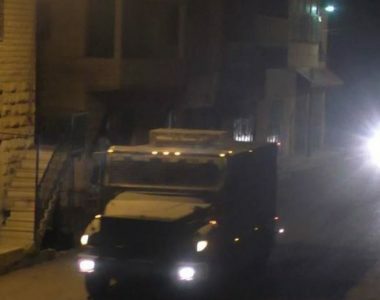 The Hebron office of the PPS, in the southern part of the occupied West Bank, said the soldiers invaded the city, and nearby communities, violently searched homes and abducted seven Palestinians. The abducted Palestinians have been identified as Amjad Qaisiyya, Mansour Salim al-Qudsi, Omar Masalma, Farouq Hasan Masalma, Ali Amer Sweity, ‘Atef Hussein Shallash and Anas Mohammad Zghayyar. In Bethlehem, the soldiers also invaded and searched homes, and abducted four Palestinians, including a child. They have been identified as Ahmad Radhi, 12, Rami al-Ahmar, Ali As’ad and Nael Abu Bakr. In Tubas, in central West Bank, the soldiers abducted one Palestinian, identified as Firas Salah Sawalma, while Mohammad M’alla, was abducted from his home in Beita town, in the northern West Bank district of Nablus. Furthermore, the soldiers abducted a teen, identified as Mohammad Habib Khatib, 17, from his home in Hizma town, northeast of Jerusalem. Also in Jerusalem, the soldiers abducted two Palestinians, identified as Ahmad Mohammad Badwan, and Tamer Wajeeh Mansour, 20, from Biddo town, north of Jerusalem.